ELEGANT ECLECTIC STYLE: The natural 2-tone color palette and simple lines of this sideboard allow it to coordinate with many homes, from traditional to modern in design! 2-TONE VENEER FINISH: Light, natural Brooklyn Oak woodgrain and Dark Gray solid veneers combine to create a wood and stone appearance that is appealing and blends with any room! 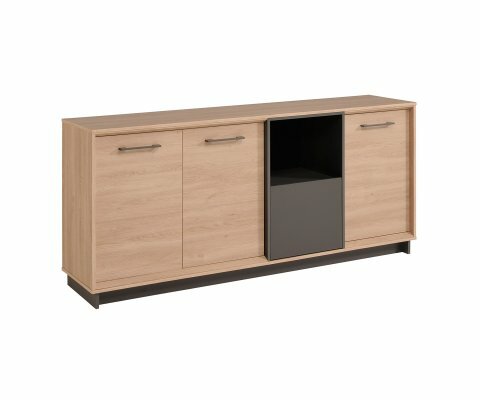 3 CLOSED CUPBOARDS: The frame and three cupboard doors are faced in Oak, with a panel of contrasting Dark Gray that features an open shelf and a drawer. 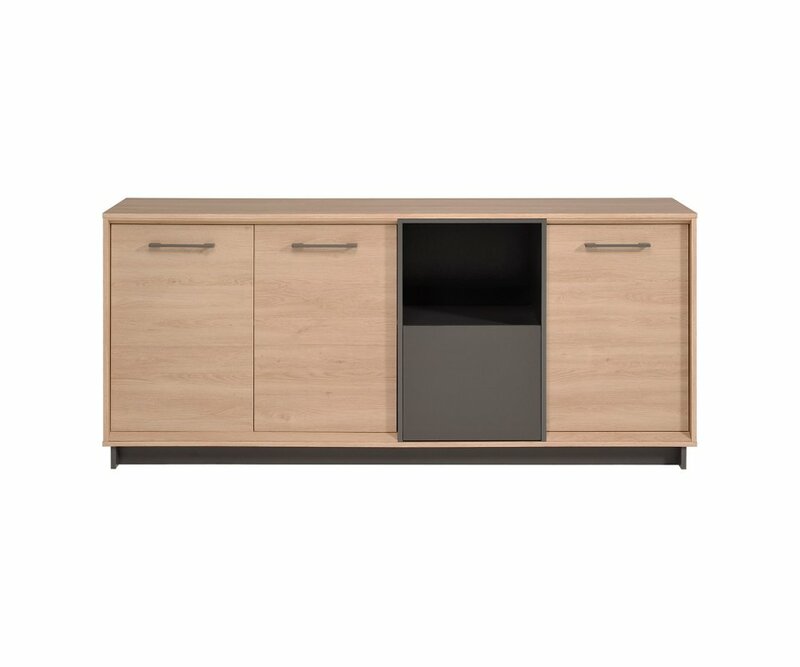 BUILT TO LAST: Manufactured from high-density MDF boards, joined with heavy-duty hardware and steel drawer slides, so your sideboard will be sturdy and long-lasting! ECO-FRIENDLY PRODUCT: Parisot of France has made a commitment to eco-friendly wood-sourcing, manufacturing, and recycling, and has been awarded Green Way accreditation. A sideboard is an essential and versatile piece for a dining area, providing storage space and a buffet serving top for entertaining family and friends! This Feel sideboard has three closed cabinets, faced in Brooklyn Oak woodgrain veneer, and opening to reveal shelves inside for china, glasses and serving pieces. A Dark Gray veneer panel features an open shelf for a pretty display piece or your wine bottles or glasses, and a drawer for linens, candlesticks or whatever you want to keep near your dining area. 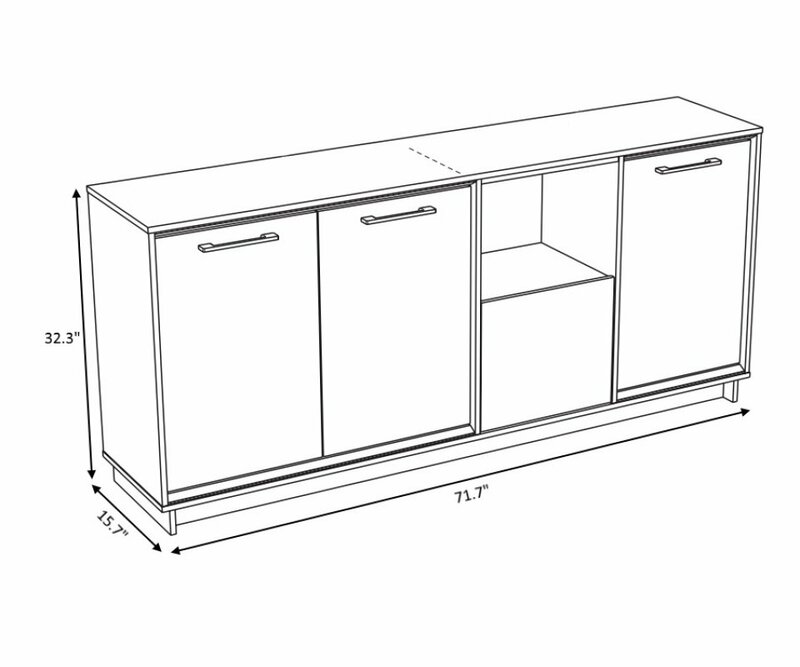 The sideboard is made from high-density MDF boards, and joined with heavy-duty steel hardware and drawer slides. The veneer finish resists scratches, stains, water ring marks, and fading, so it is long lasting and will stay beautiful for years with normal use.